For the first few days after flying into La Paz we felt a bit wonky. Being almost 4km up in the air is a strange sensation. Walking around feels a bit like being on a ship on the edge of a cliff. We experienced fairly mild symptoms from the altitude adjustment – shortness of breath, dizziness, nausea, body tingles, fatigue – and I had a constant headache that ranged from a background mumble to a full-blown ‘ouch, I need to lie down and close my eyes now’. Everyone agrees that the best antidote is the Coca plant. Although Cocaine is illegal here, all natural forms of Coca are not. Everyone chews the leaves and drinks the tea (Mate de Coca) constantly, including the Pope when he came to visit apparently. Bags of Coca leaves, Coca sweets and packets of tea are sold every second step of the way along any street. It really does help. After a couple of days lying around sipping on tea we started to feel normal again. 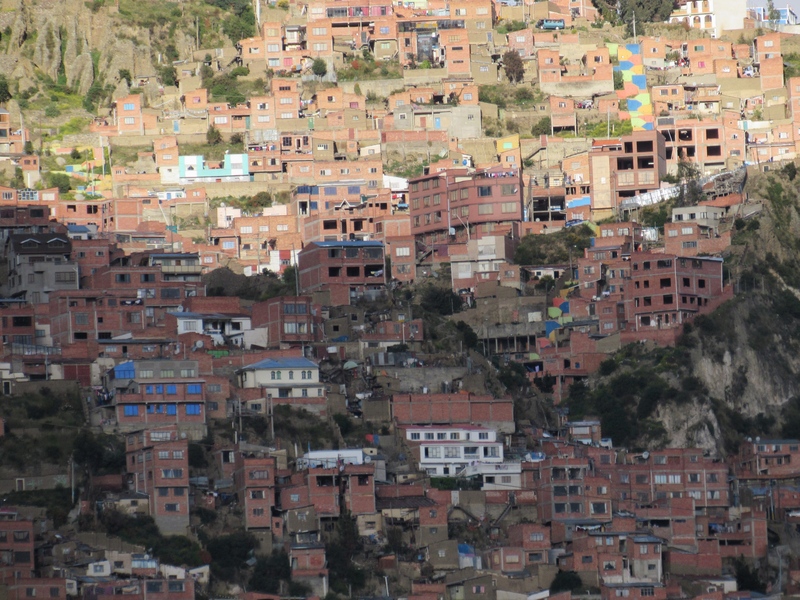 La Paz is a huge sprawling city that’s kind of ugly and kind of beautiful. Millions of red-brick three-storey ticky tacky buildings are crammed together in the valley and up the steep mountains on all sides. We landed at the top and made our way by taxi down into the valley. Even the valley is at almost 4000m elevation. It’s more beautiful at night when there are blankets of twinkling lights covering the cliff sides and threatening to slide down in an avalanche on top of us. 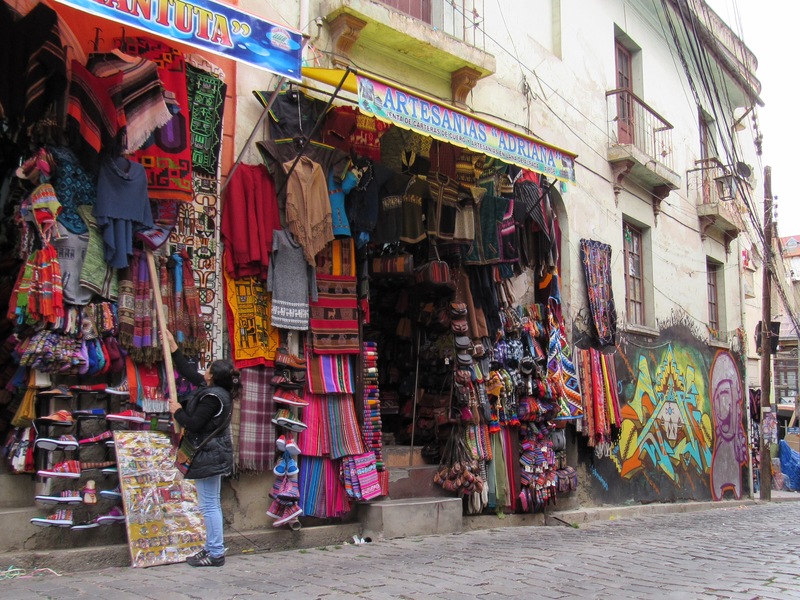 What makes La Paz beautiful and so interesting, apart from the surrounding mountains and the steep streets, is the colourfulness of the markets and the many people in traditional dress. 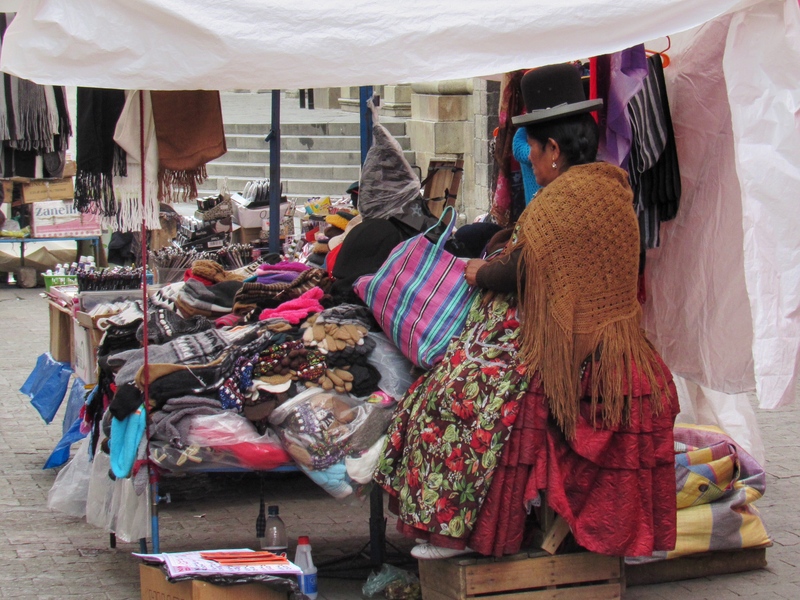 It’s mostly the older women who still wear the distnctive Bolivian costume of bowler hats, shawls, silky blouses and bright skirts with bustles. This style only dates from the 16th century. Before that the indigenous peoples wore much more practical outfits. Apparently the Spanish christian missionaries decreed that the locals had to adopt the European style of dress of the times – hence the stylish but totally impractical bustles and bowler hats. While adjusting to the altitude we didn’t go far from where we staying, just short missions out into the local neighbourhood to get essential supplies. We clung to each other like a couple of doddery old people, feeling our way along the steep streets. 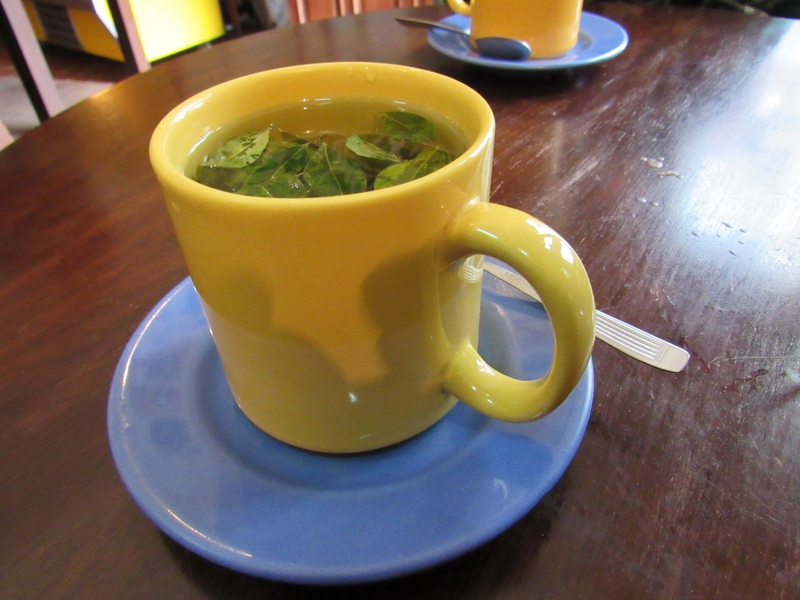 The locals thought we were hilarious and kept trying to feed us Coca leaves. Lovely people! All along the streets you see little bags of tools with the name of a trade written on them – plumber, electrician, painter, carpenter. It’s a kind of ‘Tradie’s market’ where they put their bags out and sit and wait until someone comes along with a job for them. After a few days of altitude adjustment the symptoms subsided and we headed out into the world of La Paz. It’s a great place for people watching as there’s so much going on. Everybody’s selling something or doing something. Sunday is football day and a big local match was happening. JH was very excited. The team from our neighbourhood are called ‘The Strongest’. I’ve been trying to add a video here of the fans collecting and marching to the stadium. They were having so much fun banging their drums and prancing about. Unfortunately the wifi is too rubbish to upload video, so will have to add it in at a later date. There are a lot of tourists in La Paz. It’s a bit of a shock because we haven’t really seen any others in Paraguay or in Bolivia up until now. There’s a whole area around the market street of Sagarnaga that’s known affectionately (or otherwise) as ‘Gringolandia’. 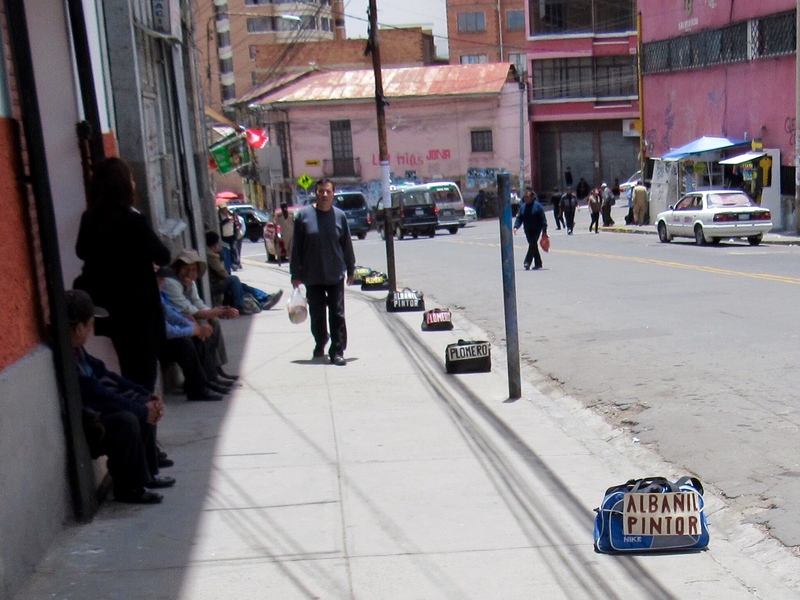 This is the place to go for souvenir shopping – small shops and market stalls line the streets selling every type of Bolivian craft and souvenir that you might want to take home. There are some beautiful textiles, wooden items and silver work but after the first few shops it’s the same thing over and over again. We didn’t really buy anything. A wall hanging might have been nice but we can’t carry it and we didn’t fall in love with anything enough to make us search out a post office and spend a day dealing with that kind of drama. At the top end of Sagarnaga is an area known as the ‘Witches Market’. It has apparently been there a long time, selling spells and various ingredients for making said spells. Rows of Llama foetuses hang outside the stalls (I don’t want to think about how they were procured!) one use of which is to bury under the foundations of new buildings. Disappointingly I loved the idea of a witches market more than the reality. Perhaps a vegan witches market would be more to my taste. 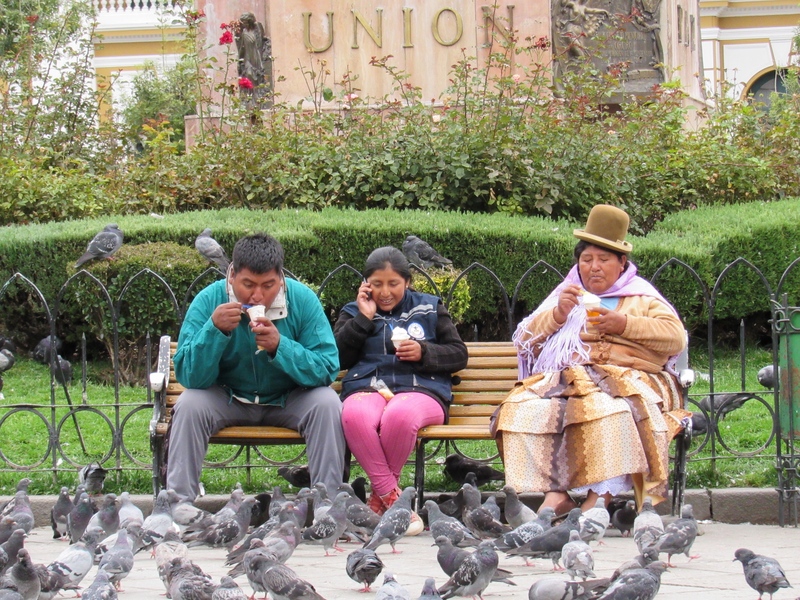 Our favourite place in La Paz is Plaza Murillo. It’s the central square or the 0km point. Having a central square in any area of human habitation is such an obviously good idea. It instantly creates a community. I think modern day urban planners have lost the plot. 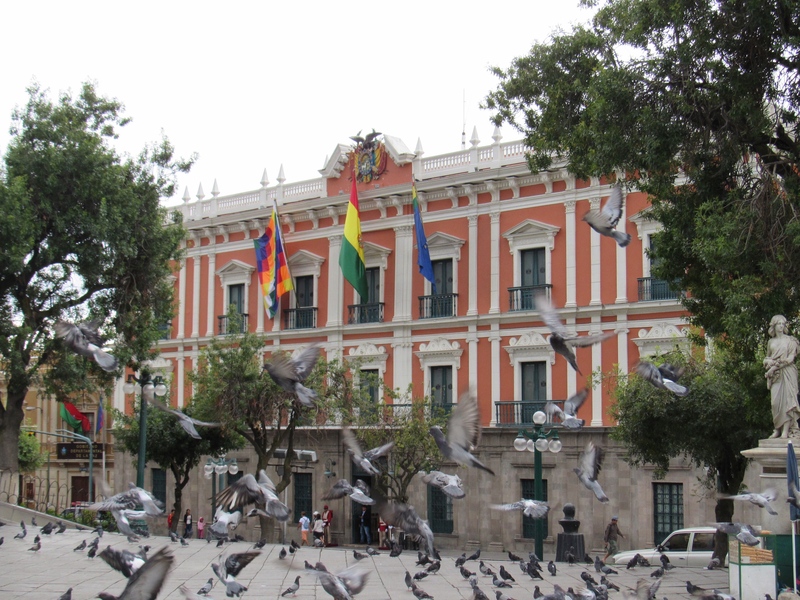 Plaza Murillo has elegant statues and is surrounded by the important colonial power buildings – church, presidential palace and such. However, Plaza Murillo is for sitting. It has more pigeons than I’ve ever seen in one place. Everyone comes to sit, eat ice-cream, contemplate and feed the pigeons. It’s a fabulous place to sit and watch. The traditional and the modern sit side by side here. This entry was posted in Bolivia stories, South America and tagged adventure, Altitude, Bolivia, La Paz, south america, Travel. Bookmark the permalink. Hey Sarah! The food has been terrible in the southern part of South America. Nothing but meat and boring pizza. Paraguay was a bit of an improvement with a few fresh veggies available and Bolivia is MUCH better. A big variety of breads and pastries. Delicious cakes. Salads at last and a lot more vegetable dishes including beans and rice.